Rheumatoid arthritis, a chronic type of arthritis, means the patient will experience pain and discomfort for a long time. Rheumatoid arthritis, an auto-immune condition, is possibly genetic since doctors have not yet established the origins of rheumatoid arthritis. 1. Rheumatoid arthritis can appear both in adults and children (the latter called juvenile rheumatoid arthritis). Doctors diagnose rheumatoid arthritis through the feedback they get from their patients. Both adults and children must have the ability to describe the symptoms accurately in order to get a proper diagnosis and treatment. This usually proves more difficult with children, as they don’t usually know how to explain their symptoms. If you suspect your child might suffer from rheumatoid arthritis, observe him on a daily basis, ask questions, get as much feedback as possible and get proper testing. 2. Rheumatoid arthritis has a lot of symptoms, including back pain, joint discomfort and pain, joint swallowing, fever, loss of appetite and aching. Sometimes people mistake rheumatoid arthritis for a simple bout of the flu. If the symptoms last for more than a few days and don’t respond to flu medication, you or your child should see a doctor. 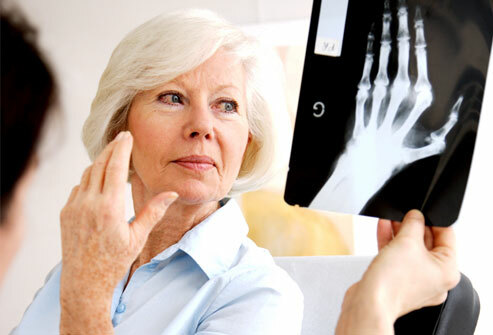 If a medical professional does not diagnose rheumatoid arthritis in due time, the joints suffer irreparable damage. 3. Your doctor will prescribe a certain treatment for you or your child. The treatment differs from patient to patient, depending on the symptoms and the stage of the condition. Make sure you tell the doctor about all allergic reactions to medication before staring the treatment for rheumatoid arthritis. 4. Doctors usually prescribe Celebrex, Naproxen or Mobic for rheumatoid arthritis. In severe cases of rheumatoid arthritis, doctors prescribe Prednisone. These anti-inflammatory drugs have different side effects. Prednisone not only subdues inflammation, but is also works in an immune-arresting manner. Celebrex proves effective in relieving rheumatoid arthritis symptoms, but it increases the risk of heart attack and ulcers. It can also prove dangerous to take if you have liver or kidney problems. Make sure you ask your doctor and are fully informed about the side effects before starting the treatment. Understand that the drugs will not treat rheumatoid arthritis, but only its symptoms. 5. If you don’t have stomach problems, aspirin can help release pain and other rheumatoid arthritis symptoms. If you have ulcers, try Ibuprofen instead. 6. Topical treatment with Aspercreme, Ben Gay or Icy Hot can also help with rheumatoid arthritis symptoms. Even if applied locally, topical treatment can also cause side effects; therefore, you should check the labels of the products carefully before using them. 7. Alternative medicine also offers a lot of options for patients suffering from rheumatoid arthritis. Some supplements with fish oil, for example, help with pain relief. You can also take warm baths with essential oils to reduce swallowing and inflammation, or you can try acupuncture and massage therapy to help your body relax and treat your condition.